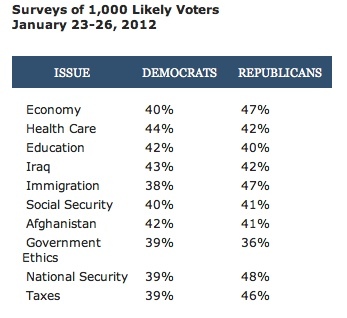 Not too many months ago, likely voters trusted Republicans over Democrats on all ten top issues. It was probably too much to expect those heady days to continue, and I suspect that the GOP presidential primary season has damaged the party’s standing. That is unfortunate: if the Republican candidates had devoted their energies to non-stop attacks on President Obama, the result would have been positive. Unfortunately, that didn’t happen, and the bashing of fellow Republicans that we have seen over the last couple of months has no doubt damaged the party’s brand. Republicans come out on top on four issues, while the other six are too close to call. Really, this is good news for Republicans: there is no issue where Democrats have a significant advantage, and traditionally Democratic issues like education, Social Security and health care are neutralized. The issues on which the GOP has a significant edge are the big ones: the economy, 47-40; immigration, 47-38; national security, 48-39, and taxes, 46-39. These are all issues on which I think voters continue to associate Republicans with conservative positions. As long as that remains the case, it is reasonable to expect Republicans to continue to hold the advantage. It is interesting that, despite all the absurdities in the news about Warren Buffett and his secretary, it is Republicans, not Democrats, whom voters trust on taxes. This is because they understand that the bottom line is that the Democrats want to raise taxes. It is also noteworthy that the GOP has a big advantage on immigration. Again, despite all of the misdirection in the press, this can only be because voters think Republicans are more likely to defend our borders. This is an issue that Republican candidates should not lose sight of between now and November. And if you want one more ray of optimism from the same source, Rasmussen also finds that fiscal conservatives outnumber fiscal liberals by nearly four to one, 42%-11%. This suggests that Republicans should not trim their sails on fiscal issues. The only caveat is that 42% also describe themselves as “moderate” on fiscal issues, and God only knows what counts as moderate when Congress runs up $15 trillion in debt.